Today I have a notoriously difficult shade to photograph - Visual Kei! I've tried my best to capture it accurately, but it does look quite different in varying lighting. All of the Lip Lustres I bought are in the trial size, which is 1.5g and contains enough for a few applications. This is a great way to try a colour before committing to a full size tube, especially since you can't see this product in a store before purchasing (Fyrinnae is only sold through their website). I love that the applicator is still a regular sized doefoot one, so it's very easy to apply. Visual Kei is a very bright pink, with a nearly matte finish. Temporary staining is likely (keep off of fabric). You can see the faint shimmer in my lip swatch, but it's not really that visible in real life. In natural light, Visual Kei is a true hot pink, while in artificial lighting it takes on a more raspberry tone (shown below). Visual Kei was a real pleasure to apply and wear. I didn't experience any drying or feathering with this shade and it wore for four hours before wearing away with food. When it did wear away, it wore away evenly, leaving a pink stain that looked like I had naturally flushed lips. 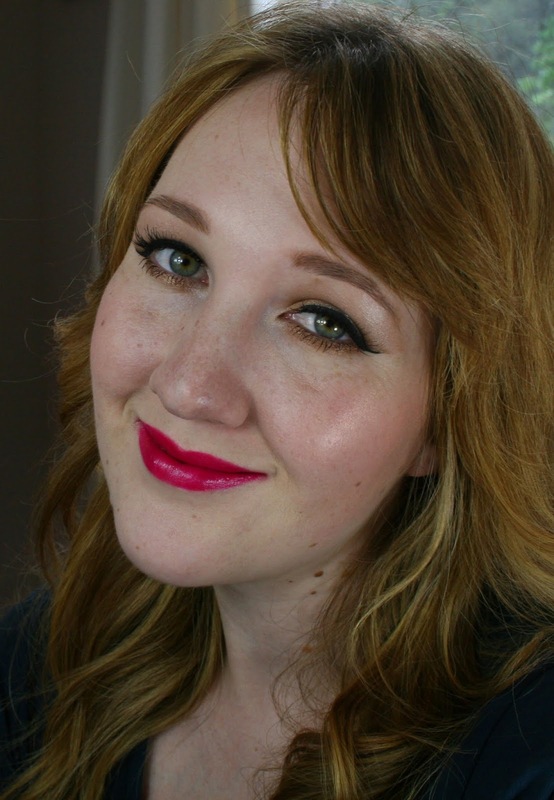 I really liked that even when the product was essentially gone, I had a wearable pink lip, which was still easy to remove with make up remover. Great price - 1.5ml trial size (shown here) is $2.00USD, full size tube is $7.00USD.